Opened just July of last year, Marisse Patisserie has already been capturing the hearts and palates of the Cebuanos. This homegrown patisserie is a result of Marisse Sy's passion and love for baking, who has long been accepting pastry orders at home before. 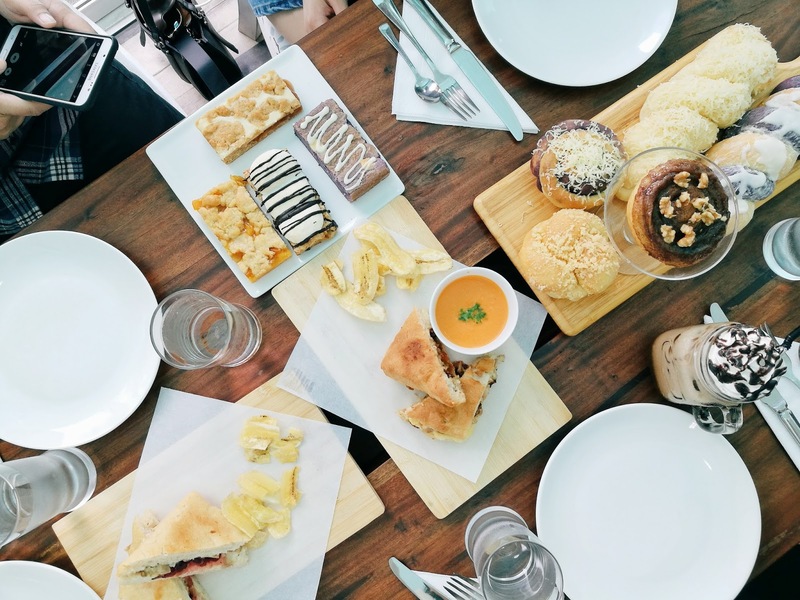 Located at 32 Sanson by Rockwell in Lahug, Cebu, Marisse Patisserie is heaven for people who want to fill their days with sweetness from their wide array of sweet concoctions such as bread, pastries, cakes, and desserts (like me!). Before entering, you'll be greeted with this cute pastel-colored sign of Marisse Patisserie. And just a few steps away, you'll see the Instagram-worthy bike by the glass door. There is another bike placed at the back of Marisse Patisserie where the garden is situated and where you can dine al fresco while enjoying a breath of fresh air. Now, when you enter the pastry shop, you'll be in awe seeing the dainty slash shabby chic theme of the entire place. The interiors are mainly white, brightened up with pastel colored decorations and rustic tables and chairs. We were not able to try these Danish pastries but don't they look so lovely and yummy? I'll surely go back for these pastries because I'm very interested in that Peach Mango Danish! I was actually not able to try them all but my favorites are Marisse's Bars most especially the Oatmeal Mango Bar. It was so yummy and chewy! I forgot the names of the other sandwiches but the one I really enjoyed the most was the Tuna Melt sandwich (first photo). The bread were hot-grilled so they were crispy which I really liked. And they go so well with the tomato soup too! YUUUUUUM! Just like any other cafe, Marisse Patisserie offers a wide variety of drinks: Hot/Iced Coffee, Hot Non-Coffee Drinks, Frozen Drinks, and Frappes. They served us different kinds of Frappes but I was only able to try the Mocha and Caramel Frappe. Both were really good and affordable too. This is Marisse Patisserie's version of the warm brownie with a scoop of vanilla ice cream. I have always been a fan of this dessert and though the brownie was a little too sweet for my liking, Marisse Patisserie's own take did not disappoint. Marisse Patisserie did not only make us try one but lavished us with seven of their heavenly cakes. It was definitely the main show of the event and I was definitely thrilled! Lemon Blueberry Cake - This is a delightfully fresh cake with the perfect combination of lemon and blueberry frosted with blueberry buttercream. Pappy's Banana Guava Cake - This cake is a delicious combination of banana cake with guava jam in between its layers with chocolate icing and cream cheese frosting. I loved the combination of banana and guava because they complemented each other so well plus the banana cake's texture was so soft and fluffy. Also, this cake was created in honor of Marisse Sy's father who loved eating bananas paired with guava jam. Ria's Banana Cheesecake - This cake is specially made for Ria Sy, Marisse's daughter, who loves bananas. Guava Cheesecake - And who would have thought that guava would make a perfect cheesecake? Personally, out of all the cakes, my favorite would be the Guava Cheesecake. It was something very new to me and it was really delicious. The cheesecake had a very dense and smooth texture that it melts in your mouth. This one is definitely a must-try when you visit Marisse Patisserie! Pecado Mortal - Pecado is a Spanish word that means "sin", thus Pecado Mortal means "mortal sin". This one is literally sinful yet heavenly with its very rich and dense chocolate ganache with hints of coffee and cashew brittle topped with dark chocolate powder. When I took a bite of this cake, I loved the rich chocolate flavor of the cake and the slightly bitter taste from the coffee and the chocolate powder made it even more enjoyable. If you're a chocolate lover, then this cake is the ultimate choice for you. Brownie Cheesecake - Another cheesecake option from Marisse Patisserie, is their Brownie Cheesecake. This is a perfect choice if you want to eat a cheesecake with hints of chocolate just enough to satisfy your cravings. Strawberry Matcha Cake - This cake is definitely one of the most unique flavor combinations I have ever encountered. Who would've known strawberry and matcha are a match made in heaven? The sweet and slightly tangy taste of strawberry perfectly minimizes the bitter taste of the matcha. And if you didn't know, I'm not a big fan of matcha-flavored food but this cake was surprisingly good for me. If you aren't convinced yet to go visit Marisse Patisserie, then I don't know what will. Every nook of this homegrown pastry shop is just perfect for your Instagram feed goals and every bite of each of their sweet concoctions is just pure heaven! I love these photos, sounds amazing! Haha have you gone to a cafe for a quick dessert fix? HAHA. Thanks for dropping by, Kim! I love this place, Ells! The atmosphere seems so nice without trying too hard, plus the sweets look super great. I have a sweet tooth so I'm a sucker for these. I especially would love to try those colorful drinks, Guava cheesecake and the Strawberry Matcha Cake! This place looks so inviting! I love the cozy decor, and their sweet treats look so delicious! Beautiful photos!